The Toros, with the addition of Pete LaCock, will have "two hitting coaches for the price of one, two different opinions," says left fielder Lino Garcia. 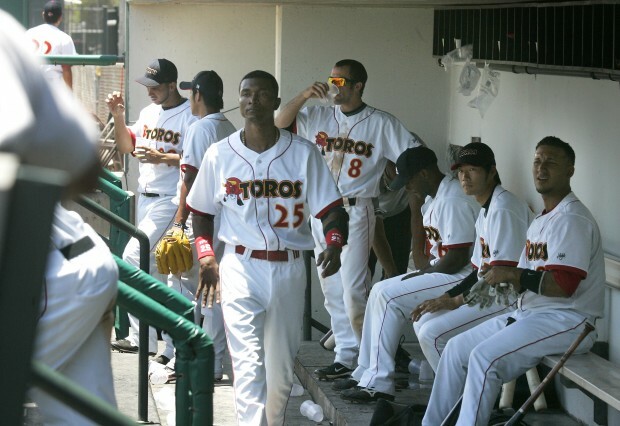 The Tucson Toros could have an advantage over other teams in the Golden Baseball League. The Toros can turn to two coaches to help them with their hitting. Pete LaCock, a former Chicago Cub and Kansas City Royal, and the team's hitting coach last season, rejoined the Toros this week after leaving his job with the independent Schaumburg (Ill.) Flyers. As an unpaid gig, LaCock will aid hitting coach Stan Cliburn in instructing Toros hitters and throwing batting practice. The Toros beat Yuma 20-2 Thursday night at Hi Corbett Field. The Toros (18-19) swept the Scorpions in three games out hitting them 19-5. "I'm just helping," LaCock said. "I'm not the hitting coach. Stan does a great job with them. Stan understands where I'm coming from. I'm just trying to find some place I can coach because I love it." Cliburn, a former Triple-A manager in the Twins organization, said the situation is a "win-win." Both have similar philosophies - they let players go out and play their game, and the next day, they may work on adjustments, Cliburn said. Whereas Cliburn likes to work with players on the field and watch the flight of the ball, LaCock does a lot of instruction with hitters in the cage. "The short time he's been here, it's been great," Cliburn said. "We've sat down and talked and figured out each other's work ethics and philosophies, and we're on the same page." Besides serving as another set of eyes to the hitters, LaCock can throw batting practice. Unlike Cliburn, LaCock throws left-handed, allowing the hitters to better prepare to face a left-handed pitcher. LaCock also will occasionally coach first base. "It's just great," said manager Tim Johnson, adding he hopes LaCock can join the team for road games. "(LaCock) knows the league, knows what's going on here." LaCock helped guide the Toros to the GBL championship series last season and to a team batting average of .304, third best in the league. Left fielder Lino Garcia said LaCock helped him mostly with the mental aspect of hitting, staying relaxed and waiting for a pitch to hit. "They say two brains think better than one," Garcia said. "We get two hitting coaches for the price of one, two different opinions, two different views." Shortstop Ryan Priddy praised LaCock and Cliburn. LaCock can also provide the team with a vocal leader, Priddy said. "We have a lot of young guys on the team, so having him and being as vocal as he is, it helps the younger guys understand what's expected and what needs to be done," Priddy said. "That's the one thing Pete brought last year, a very vocal leader." LaCock said he left Schaumburg after he didn't get along with Flyers manager Mike Busch. "These guys here, (pitching coach Jason Jacome) and T.J. and Stan, they have a lot of respect for the game," LaCock said. • The Toros set a franchise record for most runs in a game with 20. The previous high was 16 against Chico last season. • The Toros led 14-2 after three innings, scoring 10 runs in the third. Tucson sent 14 batters to the plate, got eight hits, and left one on base. Yuma also committed an error in the inning. • Wally Backman Jr.'s grand slam, his third homer, gave the Toros an 18-2 lead in the fourth. • Toros starter Albie Lopez (3-3) allowed two runs (one earned) and four hits in five innings. • Cristobal Santana extended his hitting streak to 18 games with a two-out single in the first.